Co-written with Ben Koh, Frederike Kress, Jay Mirchandani, Millie Doze and Katie Mcallister. 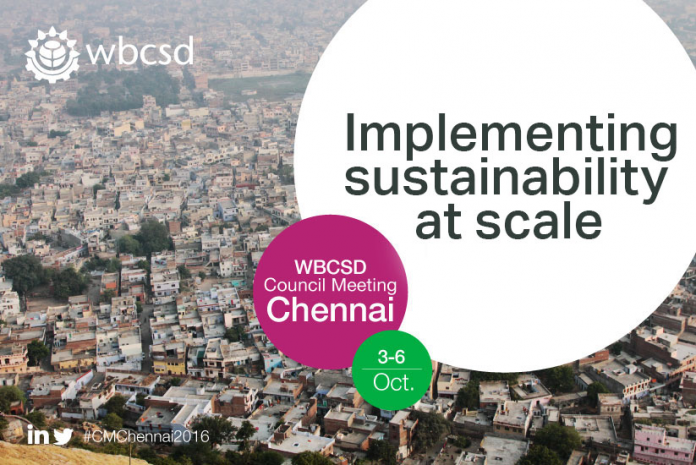 Ten LUMS students were given the opportunity to receive first-hand information on sustainable development at the annual meeting of the World Business Council for Sustainable Development in Chennai this October. As sustainable development and enterprise is a big part of all of our lives, a focal point of our careers and a determinant of the lives of future generations, it was of great importance to every one of us to educate ourselves and become involved with the matter. With rising sea levels and unprecedented global temperatures, the consequences of climate change are becoming increasingly urgent. The WBCSD is a forum where business leaders from across the globe meet regularly to find innovative solutions to combat contemporary, environmental problems. This October, the CEO’s from the world’s leading companies meet in Chennai, India to set milestones for the following year. The WBCSD Council Member meeting is exclusively for WBCSD members and invited guests. This unique opportunity has been made possible thanks to Dr Rodney Irwin, the WBCSD Managing Director for Redefining Value and Education, together with Professor Gail Whitman and Dr Alison Stowell. The following students are honoured with this opportunity: Frederike Kress (European Management – Double Degree), Julius Kup (European Management – Double Degree), Ben Koh (BA Hons Economics and Human Geography), Millie Doze (Management, Politics and International relations), Callum Hudson (BSc Hons Business Studies – Industry), Gareth Gartside (BA Hons Management and Organisation), Alice Hunt (Business Economics – Industry), Katie McAllister (Management, Politics and International Relations), Divesh Lachhwani (Finance & Economics) and Jay Mirchandani (BA Hons Management and Entrepreneurship), thanks to the financial support of the University’s international project team, LUMS, the Department of Organisation, Work and Technology and LUSU. The competition was announced among students who chose to study sustainability and management in a wider context in their second, third year or fourth year. Here at LUMS, the module OWT.230 (Management, Sustainability and the Natural Environment) tries to enable awareness for sustainability in enterprise. Each student has their own unique interest in the topic of sustainable development, for example, Frederike Kress, who interned with GLS Bank (Europeans Sustainable Bank of the Year 2013) this summer, hopes to gain more knowledge on how innovative projects are financed and Ben Koh, who recently won £1000 in UCAS’s 2016 “Love Learning” competition by creating a short video on education, is interested in how increased environmental and political pressure stimulates innovation in the domain of sustainable business. The students will have the chance to play an active role at the meeting, working as session hosts and note takers, as well as having the opportunity to network with business leaders from firms such as Santander, Unilever and PWC which will not only provide them with the opportunity to enhance their own prospects, but also to act as ambassadors for the University and continue to retain the university’s prospering global status. The conference will be held at the ITC Grand Chola Hotel – the world’s largest LEED (Leadership in Energy and Environmental Design) platinum rated hotel, giving the WBCSD participants the most optimum environment to thrive and learn. The week away in Chennai will consist of various activities other than just conferences. For example, there are field trips planned in order to show the action taken in Chennai to create the sustainable world we desire. Chennai being a very urban area in one of the fastest developing countries globally is a tremendous place for us to see first-hand the implementation of such strategies and for us to expand our experience of different cultures in order to help us in our research. When researching the WBCSD, student Divesh Lachhwani remarked how fascinating it was to find out that the council was set up with the aim to “ensure the business voice was heard”. It is primarily focused on the uprising and importance of business and economic governance in relation to sustainable development, which would inevitably lead to a more sustainable society. Moreover, they set up several indications of how businesses around the world should incorporate social responsibility and use corporate governance effectively. This has played a key role in supporting many businesses around the world in their efforts to generate more research and ideas concerning climate change and corporate sustainability. The focus of the past decade at WBCSD has been to solve complex issues and provide innovative solutions to achieve their latest project, the Action2020. This project was developed to further progress on sustainable development and raise awareness to solve the environment and social issues the world currently sees as ‘the need of the hour’. In order to take part in the trip, students were asked to write an essay exploring Action2020- an agenda that encompasses several areas regarding the ability to perform sustainable business. This embraces the concepts of business strategy and environmental priority areas (such as water and fuel), yet Action2020 embodies much more than these components. Led by the WBSCD, Action2020 enables businesses to have a platform to perform positively in regards to aiding the environment. This is important as it allows for the business to internally monitor individual attributes in order to assess the relevant demographic resulting in collaboration for a more sustainable future. Not only does it allow businesses to exercise sustainable working practices internally, Action2020 creates a sense of global community whereby values between various corporations are shared and advanced on one stage. A vital aspect of such work is the passion behind it, as in order to be able to fight global issues such as climate change, corporations need to value and work towards the same thing- and Action2020 provides the foundation for this. “The work of the WBCSD has and continues to motivate many to adopt sustainable, innovative practices which can create a sustainable future for enterprise and the environment.” Says Millie Doze. Jay M commented, “As students with an interest in sustainability we are privileged to have the opportunity to further our knowledge and passions in this field of work”. In addition, Divesh Lachhwani believes that “The WBCSD creates a sense of optimism for future generations to come and we, at Lancaster, are proud to part of the road to sustainability”. Attending the council meeting in October is a way for people to engage with such work and be able to spread the value further and seek to create a more sustainable future together. Follow our team on Twitter (Hashtag #LUMSatWBCSD), Instagram and their blogs where they will share interesting background information about themselves, their preparations for the conference, and their time in India. Scan the QR code to get directed to their blog!